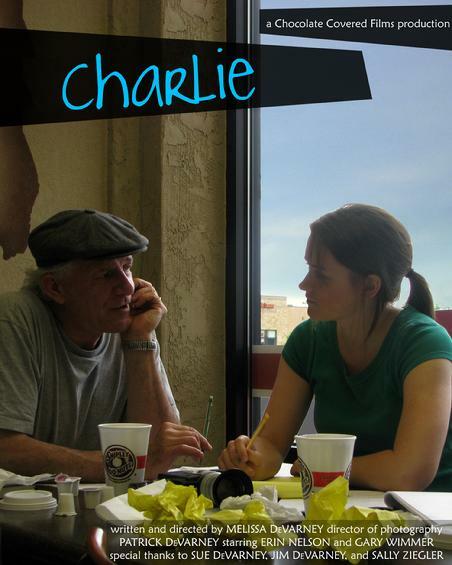 Charlie is the story of a struggling filmmaker, Charlie Mallory, who almost gives up on her dreams when she meets Alan Smithee, a man with a mysterious past and a lot of knowledge about making movies. Over two years of writing, production, and working on technical difficulties post-editing around my school schedule, this 20 minute short film was finally completed. I wrote the script in late 2007, went into production early spring 2008, and went through post in late spring 2008. By the end of that school year I had a 20 minute film under my belt that I was quite proud of. School ended soon after I "finished" my film. Then I realized that my audio was out of sync. For fellow film geeks- my footage was shot in 24p and somewhere in the transition to FCP -> Soundtrack -> FCP the audio got set to 29.97 fps. That meant that it started out looking like it was in sync (which is what I tested when I first burned a DVD as I didn't want to sit through the whole thing to make sure it worked... big mistake.) but as the film went on the audio got more and more out of sync. It got to the point where a character would be speaking in a conversation with the other character's voice coming out of their mouth. Ridiculous. The Lesson: ALWAYS watch your entire finished piece when you burn it to a DVD, tape, file, or send it to the moon. ALL the way through. That summer I didn't have access to FCP so my plan was to fix it when I got back to school after the summer. The problem? We started Studio 44 which took up class time and time outside of school (which was an AWESOME project, but meant that "Charlie" had to get put on the back burner). Summer of 2009- I got Jude, my lovely Macbook Pro, and started to fix the problem. Long story, more technical difficulties... I had an extremely busy summer so, again, "Charlie" wasn't fixed. When school started up I tried to work on the film on weekends but eventually Italian class sucked away my life, my time, and my sanity as I sadly became devoted to flash cards and crazy verbs instead of my beloved film. So what is "Charlie" about? It's a story of a struggling independent filmmaker named Charlie who meets Alan Smithee, a theater owner who tries to rekindle Charlie's passion for film. The film also touches on the history of the Hollywood Blacklists. I haven't lost my passion for film, but since it is one of the most important things in my life it is one of the things I would be most sad to lose. What better medium to express my love of my passion? It was the hardest project I've taken on, and although there's a lot that I've learned in two years that would make me do things a little differently I am still proud of this film. Fun Fact: "Alan Smithee" is the name filmmakers used to use in the credits of films they didn't want their actual name to be associated with. This factoid doesn't relate to why I named the character that, but I suppose you could write a long scholarly essay analyzing it if you wanted to.